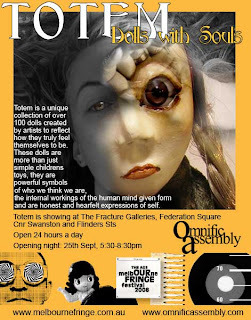 Totem, Dolls with Souls, the doll exhibition I’m curating for Fringe, opens on the 25th of September at 5:30 to 8:30 at Federation Square, Melbourne. I’d love it if you could be there! I’m terribly excited about it, come one, come all, bring everyone you know and invite some people you don’t! It’s me and my Totem doll. Please note: The image on the Totem flier is a fusion of a photograph by Ilona Nelson and a doll by Beth Robinson. Thank you!